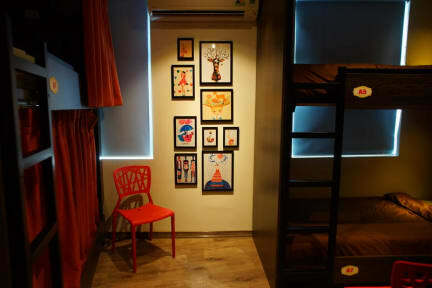 V Hostel is located in the middle of Hanoi Old Quarter Part, which is conveniently just a three-minute walk to Ta Hien Street – the lively heaven of bars and street food and Dong Xuan Night Market, the spotlight of Hanoi nightlife. Great find and super affordable. Friendliest staff I have met in a hostel in months and months. They really made my stay good, recommending the best local food and telling me some interesting history. Nice quiet rooftop during the day, rooms very clean, bathrooms private and very nice. Note that bicycle parking is on the street during the daytime so bring a big lock. Very nice place, very comfortable mattresses and good breakfast! Fantastic location! Very close to the central backpacker area, with lots of fresh beer for 5K in the streets. The beds were very comfortable! All around really good hostel. This is a great place! It is hidden on a side alleyway away from the main stuff, but it is only a 10 minute walk from the lake. The night market (on Friday) is literally the next block over, so super convenient if you want to buy a bunch of stuff! haha. The staff are very friendly and helped us with booking our tours. The only thing is that the lockers are super loud. Also, some of the furniture is broken.... For example, my bed's sidewall was completely torn off. Staff: very helpful. Booked all our tours with them at a competitive price. Bathroom: shared bathroom on each floor. Was always clean when we used it. People still flush toilet paper even though there are signs, and the toilet did block. Beds and location were great! Major issue: The rooms were damp with mould on every wall. Don’t stay in the 4 bed female dorm. Bigger dorm had less mould and was drier. The hostel was clean and well situated in the Old Quarter. The only reason staff got a low score was because the person who checked us in sold us bus tickets that she gave us the wrong information for (wrong bus type, wrong pick up time) and then staff in the morning was blase when we thought our bus had left without us. We didn’t have the free breakfast as we had a bus to run for. Pros: Comfortable bed Clean toilet Free breakfast Good location Big locker Cons: Small common area No parking for motorbike at night Conclusion: It was generally a good hostel. I would have given over 8.5 rating if not for some other issues which I don't want to go into detail. Day staffs are mostly friendly.